Despite intense competition to find and retain the right employees from the pool of available Millennials, Sarah Nahm saw companies continuing to re-invent the hiring wheel, wasting time and money repeating the same old mistakes. It was especially painful for small businesses that had less time and fewer resources to spare on making bad hires. She set out to help. 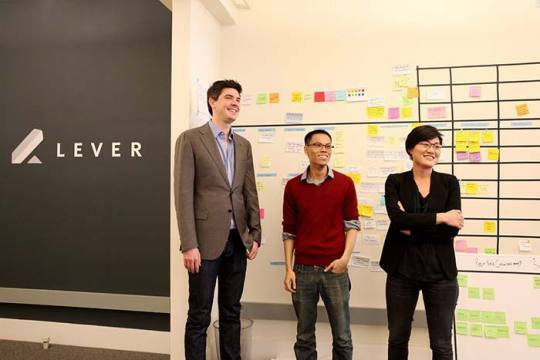 A 2008 graduate of Stanford and a former member of Google’s Chrome team, Nahm, pictured with her cofounders here, founded Lever in 2012. It’s a Silicon Valley-based software startup whose tools, introduced in 2014, now help growing businesses including Github, Lyft, and Foursquare to identify and hire the best talent without compromising culture or values. Nahm’s approach seems to have struck a chord with top employers of Millennials: Individual investors in Lever include the CEOs of Yahoo, Box, and Yelp. To develop them, her team “went deep inside Silicon Valley’s fastest-growing companies for user research.” With her thumb on the pulse of tech industry and startup hiring, Nahm has accumulated some valuable strategic advice. She offered these insider hiring tips to Yahoo Small Business readers. 2. Leverage technology. Nahm says even advanced tech companies still manage the hiring process with old-fashioned spreadsheets and email. An applicant tracking system like Lever’s helps the entire team stay on one page, she argues. “Lever produces the latest and most modern applicant tracking system to help small businesses share the load of hiring, and it uses Gmail and Google calendar. It also offer integration to other talent technologies,” she says. Instead, Nahm recommends encouraging hiring managers to ask about past projects and results. “Past performance is the best predictor of future performance,” she notes. You might ask different interviewers focus on different skills, and inform each one what to look for. Make them personally responsible for interviewing to dig into one dimension of a skill, she says. 4. Grow your employer brand. “Candidates are researching your company way before they think about applying,” Nahm says. “They think about what it’s like to work there.” On this front, she says, small businesses can increase their advantage by having something to offer such as perks, training, growth, or community service. “But be sure you really know the value that you’re offering in conjunction with opportunity you’re offering. Once you understand what is special about your company, write blog posts that share what it’s like to work there, and have a presence on LinkedIn, Facebook, and Glass Door,” she says. 5. Empower every employee. Hiring should not be the sole responsibility of the small business owner, Nahm says. “Let hiring be a job you share across the entire company to help the company grow.” Requesting referrals is one of the best ways to involve employees in hiring, Nahm says. “Ask every employee to make referrals. Show people the way they can refer their friends and colleagues. Just opening up the portal and showing them how to use it can reduce the friction.” With Lever’s tools that let employees refer job candidates, Nahm says her customers’ referral rates have gone up as much as 30 percent.